A prominent work of Chicago public art has been out of the public eye for almost five years. Titled “Above and Beyond,” the installation commemorates American soldiers who lost their lives in the Vietnam War. Before it reopened to the public, “Chicago Tonight” spoke with the partners who brought the work back into the spotlight. 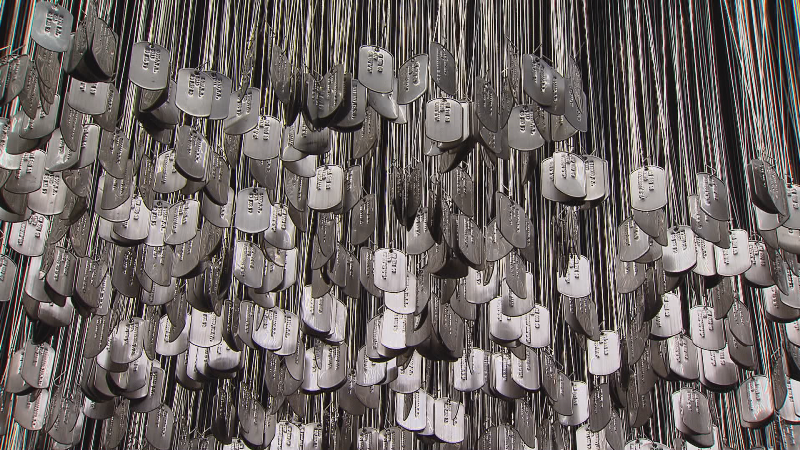 Phil Ponce: Inside the Harold Washington Library, more than 58,000 dog tag replicas represent the U.S. military personnel who died in Vietnam. Like the Vietnam Veteran’s Memorial in Washington, D.C. known as “The Wall,” this work invites reflection on the consequences of war. Lionel Rabb, National Veterans Art Museum: D.C. has The Wall. There’s a traveling Wall, but there’s no other memorial outside of D.C. that people can see, and so the artist took a different play on it in some ways to represent something they connected to, which is the dog tag, which identifies your brother in arms, or sister. It was made by four Vietnam veteran artists. It was Ned Broderick, Rick Steinbock, Mike Helbing and Joe Fornelli. Each played a different role. Ponce: The work was completed in 2001 and installed in the original home of the Veteran’s Art Museum on the Near South Side. But when the museum moved to a new location in Portage Park, “Above and Beyond” was placed in storage. At the Washington Library, the artwork occupies a space that can be seen from different levels of the building. Brian Bannon, Chicago Public Library Commissioner: I think it was important to the museum and certainly important to the library that we put this installation in a prominent area of the library that has high visibility. This area where it’s installed is the most highly trafficked area of the library. Essentially you can see it from three different floors from the bottom floor all the way up, and then it provides a unique viewing opportunity to walk all the way around the exhibit on the third floor to be able to see it. Rabb: The installation sequence is in death order, so the first tag all the way in the front left is the first person to die and the back is the last people who died. The black dog tag is for all the people who died as an effect of the war, so people who died from Agent Orange, people who died from a wound or suicides, so it really represents all the other veterans and people who fought that won’t be recognized on the wall. Bannon: We have 80 libraries around the city of Chicago and not only do we provide rich collections, but we’re also an artery for the culture and rich heritage of the city. So when the National Veterans Art Museum approached us about this collaboration we were thrilled at the opportunity, not only to bring a world-class piece of art available for everybody in the city to see but also the rich programming and conversations that come along with it, which is really in our wheelhouse as a library. Ponce: It’s a long-term loan to the library, but the work belongs to the National Veterans Art Museum, where war is the dominant subject. Rabb: Specifically combat-inspired art, to really help society reflect on war and the costs of war and the individuals who fight the war. Today less than 1 percent of people go to war, and during Vietnam at least you knew someone from the block who went, and in World War II everybody went. And we get further and further distant from the idea that we’re currently in an active state of war and that people don’t necessarily—they’re not active in that conversation, they’re not reflective of it. And pieces like this—it’s a very different conversation than just going and reading about the history of. You will come up the escalators at Harold Washington Library and see in a sea of dog tags the impact of 58,000 people dying. Our hope is that people will think about it and discuss it. And war is hell and there’s glory but we need more conversation. "Above and Beyond" is now on display at the Harold Washington Library and will be there for four years. The library is located at 400 S. State St. and is open from 9 a.m.-9 p.m. Monday through Thursday; 9 a.m.-5 p.m. Friday and Saturday; and 1-5 p.m. Sunday. For more information about the library, please go here. Dec. 9, 2015: See incredible images of combat zones around the world with a woman whose war photographs caught the attention of Steven Spielberg. Meet photojournalist Lynsey Addario. Nov. 11, 2015: On this Veterans Day we hear from two men who served their country and are now featured in a new book of remembrances by Chicago-area veterans. The book, “I Remember: Chicago Veterans of War,” features the memories of 50 veterans who served in World War II, Korea, Vietnam, Bosnia, Iraq and Afghanistan. Oct. 7, 2015: A new exhibition in Chicago showcases a collection of rare images and films from Vietnam, and the cameramen–many of whom were enlisted soldiers– who captured them. Three such veterans join us to discuss their experiences documenting that war.